Touch Screen Compatible: Enjoy the full use of your Smartphone through the protective screen cover on the armband with fully touch compatible, easily answer calls, manage your playlist, or activate your stopwatch without removing the phone. Universal Sizing: Fits both iPhone and Android models including iPhone 6, 7, & 8, along with Samsung and LG models. Case size measures 3.94" x 6.69"
Armband Features: Water resistant design protects against water and sweat. Built-in key pocket; secret compartment stores your house key while exercising. If you have any questions about this product by RJA Enterprises, contact us by completing and submitting the form below. If you are looking for a specif part number, please include it with your message. 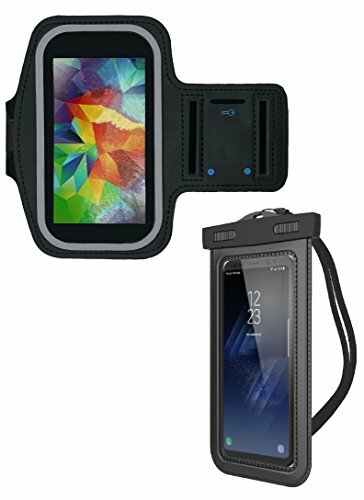 TuneBand Go for iPhones (all models), Android Phones (including Samsung), iPod Touch, HTC & Others - Premium Universal Armband with Two Elastic Straps (Case recommended. See below for dimensions).